There’s no need to watch the Giants anymore. Not only because their season is over and they have nothing to play for, but because I know how every game will play out. The Giants are unable to score touchdowns, they get behind, they stage a late comeback in garbage time to keep the score close and then either the defense can’t get a stop in the final minutes to get the ball back or the Giants need to recover an onside kick for a chance at a miracle win. Every week that same game unfolds and this week it was no different. The league has made it virtually impossible to play defense in 2018, but not when it comes to playing against the Giants. The Giants scored just three points in the first half and 10 in the second half with seven of those 10 coming with the game over. They were held scoreless in two quarters and essentially scored six points in a home game … in 2018. Odell Beckham, Saquon Barkley, Sterling Shepard and Evan Engram are all on the Giants and the team scored six points in a home game … in 2018. The only thing left to do when watching this team is laugh. Laugh at the offensive line, laugh at Eli Manning’s checkdowns to Barkley, laugh at Beckham’s big numbers in losses, laugh at Shepard’s drop, laugh at Engram’s all-around game, laugh at the defense when it needs one stop to potentially win the game, laugh at the offense on every red zone trip. And most of all, laugh at Pat Shurmur look completely bewildered and out of place on the sideline as head coach. The new Giants regime royally screwed up. They looked at the 2017 Giants as anomaly and a team that dealt with injuries and turmoil and decided the team was closer to the 2016 version which won 11 games and not the 2017 version with won three. They built around a three-win team instead of rebuilding it and tried to patch up an offensive line when what they needed was a new boat. Prior to the season, Shurmur said the team would go as far as the offensive line would take them and the offensive line has brought them to one win in eight games. 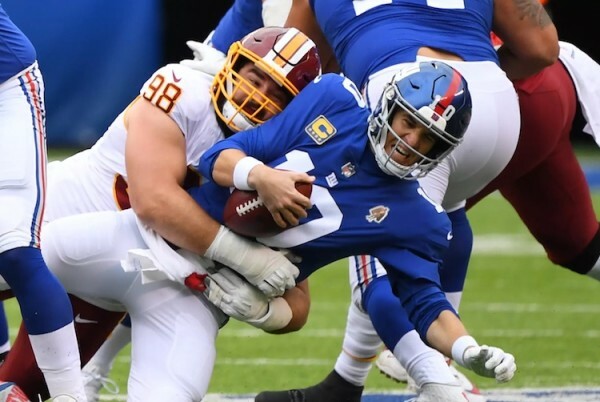 Before the latest loss to the Redskins, the Giants got rid of another former first-round pick and a big free-agent signing. It was the first time the front office let it be known that they screwed up as they decided to start selling off pieces in an attempt to stock up on draft picks to actually rebuild. Everyone thought the Giants missed their chance at a quarterback of the future picking near the top of the draft in 2018 and no one thought they would be back in that spot for a long time. But they will be back in that same spot and possibly even at the top of the draft let alone near the top of it in 2019. They are every bit as unprepared, frustrating, undisciplined and flat-out bad as the other one- and two-win teams in the league and they have just as much of a chance as any of those teams at the first overall pick. The only difference is those teams were built on the idea of picking first in 2019. The Giants were built on finishing first in 2018. The Giants won’t lose this week thanks to their bye. But when they return from a week off, they will have half of their season left with nothing to play for. When the 2017 season ended so early, the team gave up and decided that with nothing to play for, they weren’t going to play. This regime thought last season was an anomaly, but over the second half of the season, they will find out just how different this team is to last year’s, if it’s different at all. So far it is hasn’t been.